I often see new photographers asking what gear they need to take better photographs. This question annoys me as the cheapest of DSLR and mirrorless cameras and lenses can produce more than acceptable images. The most important tool you can use in photography is all around us, and if you are prepared to wait, is free of charge. I am talking, of course, about light. The word photography is derived from two Greek words. ‘Photos’ and ‘Graphe’ which when combined together mean drawing with light. As light is the key ingredient that we paint with then if you use the best quality light you will get better photographs. The subject for this week’s brief blog-post came from a Switch to Manual workshop I was running in Edinburgh. The group and I had been switching throughout the session between cloud and sunshine and learning how to manage these two different conditions. At the end of the workshop, our last location is the Members Block of the Scottish Parliament. Each of these windows is the office of a Member of the Scottish Parliament. They can look quite magnificent with the right conditions of blue skies and puffy white clouds. As this had been the weather for the past 2 hours I thought we may be in for a treat and sure enough, when we arrived we had sun and cloud. As I took the first demo shot (on the left) for the group to show them the interesting angles we could use the sun moved behind a cloud. It’s not a bad shot but it doesn’t show the contrast that light can have on the building. I glanced over my shoulder and could see that the cloud was moving quickly and would soon clear the sun. Twenty-nine seconds later the second photograph was taken. You can see the tremendous difference between the two images. Both were shot with an aperture of f11.0, ISO 100 and shutter 1/250th yet the second shot is significantly better through the use of better light. Even more time makes light work too! Over the weekend, I was on a short holiday to the Isles of Islay and Jura. I have started to get to know these islands well but was exploring some new locations. This point on the shores of Loch Indaal near Port Charlotte was a new one to me. 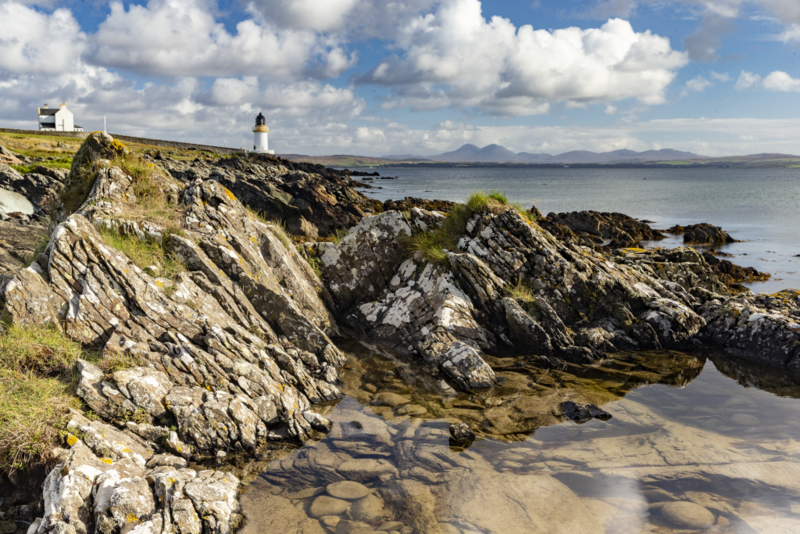 I was attracted by the lighthouse protecting the shore and the magnificent Paps of Jura in the background. Yet again, I was faced with changeable conditions but this time I had far more time to play with as I was on my own. The first shot was taken at 10:46 in the morning and is a pretty dull shot with the foreground rocks appearing dark and dominating the scene. It’s also difficult to see the rocks in the pool at the front as the Circular Polariser wasn’t having the maximum effect. If you look on the distance you can also see that the fields are partly covered by dim light where the clouds were also shading the ground. However, I could see that the clouds were moving quickly so I just had to wait. Five minutes later the entire scene was transformed with sunlight hitting the near rocks and the fields in the distance. From a scene prevailing in dark tones it was reconstructed to a vibrant image. We can see right through the water to capture the rocks in the pool as well as the bright colours in the rear of the shot. These are just two example images that I experienced in the last week but the next time you are waiting to take a photograph, ask yourself if you are using that free resource of light to the best capability. You can subscribe to our monthly newsletter by clicking here which gives you added extras and the chance to win vouchers for Edinburgh Photography Workshop sessions. As well as being a location on the Switch to Manual Workshop, this will be a spot we will visit on the FREE Worldwide Photowalk on Saturday, October 6th. This is an annual event run throughout the world and allows photographers to meet up, have a chat and take some photographs. I am hosting the Edinburgh Old Town event this year and up to 50 photographers will be walking from the Grassmarket to Holyrood along the famous Royal Mile. The event is also raising funds for a very worthwhile charity called The Springs of Hope Kenya Orphanage. It’s great if you can donate to them but you don’t have to. To sign-up and join me on the walk click here.